Unique Scottish sound and energetic performance! Headlining the 2018 Dayton Celtic Festival! Heron Valley tour as a 5-piece line-up in the US. 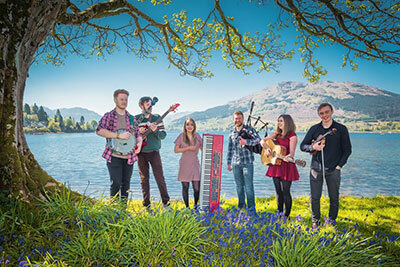 The band will convey their unique Scottish sound and energetic performance to ensure their audiences are absorbed by the enthusiasm. This will comprise of a lineup of Bagpipes, Fiddle, Vocals, Whistles, Banjo, Guitar, Piano, Drums, Bass and any other instrument they can get their hands on! Along with this, Heron Valley are an extremely friendly group of individuals who love to travel the world, and so the opportunity to play music in the US only adds to their energy on stage! Do not miss Heron Valley's debut at this years Dayton Celtic Festival! Saturate your senses in the sights, sounds, and tastes of our Celtic heritage. Discover the magic that keeps people returning to Dayton’s Celtic Festival year after year. Come and experience the rich traditions that we Celtic folk hold dear to our hearts. Saturday, July 27, 11.30 – 11 p.m.
Sunday, July 28, 9 a.m. – 6 p.m.
United Irish of Dayton, Inc.